The footrace might disrupt a summer Saturday morning in sleepy Cape Elizabeth, but the local supporters wouldn't have it any other way. CAPE ELIZABETH — Ben Morrill looks forward all year to the Beach to Beacon 10-kilometer footrace. For Morrill, a Cape Elizabeth resident who lives on Shore Road just north of the course, the race is all about family and friends. Roughly 10 of them will join him in Saturday’s race, including his brother Nick Morrill of South Portland. Then they’ll cap off the day with a lobster bake. “It is one of my favorite days of the year,” Ben Morrill said. 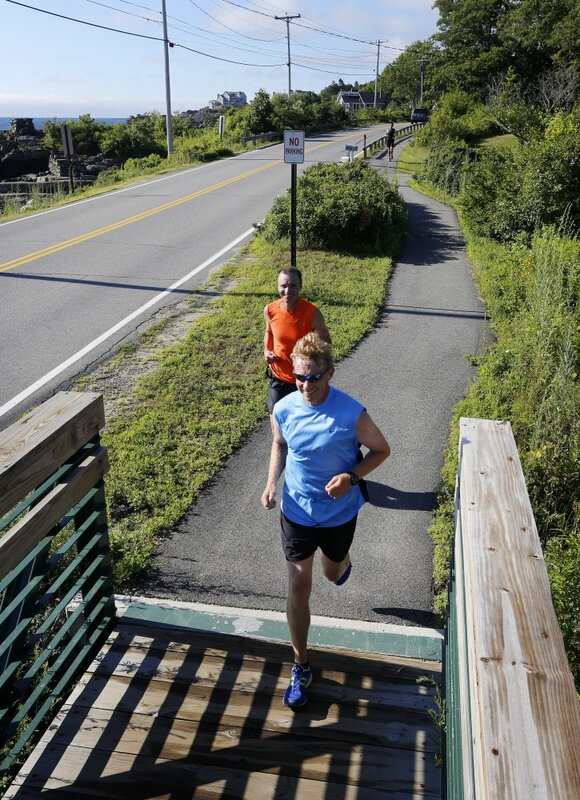 The Morrill brothers were part of a steady stream of runners training Saturday on the course, which starts near Crescent Beach State Park on Route 77, winds through town and ends at Fort Williams Park. The brothers started training in April. The two register their father, Jon Morrill of Portland, for the race as a birthday present every year. The senior Morrill set out on the course Saturday about an hour after his sons. They were among those planning ahead for the 18th running of a race that transforms sleepy Cape Elizabeth. For a few hours each year, thousands of people descend on the town, creating traffic jams, shutting down the town center and effectively taking over Fort Williams Park. The event draws world-class runners and well over 10,000 total participants and spectators to the seaside town of 9,000. Despite the disruption, Cape residents, for the most part, seem to be as pleased as anyone. “I love it,” said resident Ginger Johnson. Johnson and her family – including her husband, Greg; their children, Hadley, 8, and Cora, 10; Johnson’s mother, Madonna Browne; and the family dog, Barnacle – were running Saturday at Fort Williams Park in preparation for the big day a week away. Johnson said she grew up in Cape Elizabeth, moved away shortly before the first Beach to Beacon, and returned three years ago. “My mother said, ‘You have got to run the Beach to Beacon,’ ” Johnson said. More than one in 10 residents is expected to run in the race or volunteer to help make it happen, either by hosting elite runners from away, handing out water along the race course or performing other tasks. 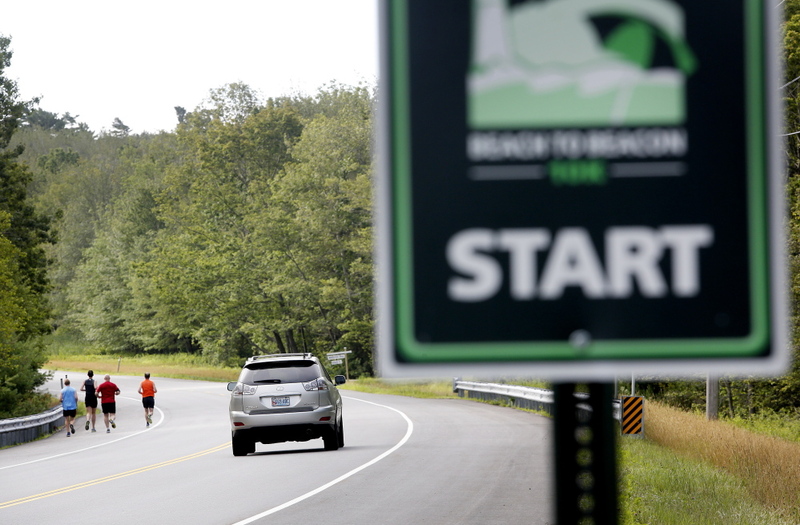 There are 773 Cape Elizabeth residents among the 6,000 people registered for the 2015 TD Beach to Beacon. About 160 of the more than 820 event volunteers are Capers, said Maya Cohen, volunteer coordinator. And many of those who aren’t running or volunteering will be lining the 6.2-mile-long race course and cheering. Some even perform live music each year for the passing runners or set up mist sprayers to cool them down. The strong relationship between the Beach to Beacon and its host town started with the race founder, Olympic champion marathoner and Cape Elizabeth native Joan Benoit Samuelson. Long before the 10K race began in 1998, the town erected a bronze statue in the town center that depicts the hometown heroine waving the American flag after winning her gold medal in 1984. It also helps that the race covers all of the town’s costs for police coverage and pays $25,000 a year for the use of Fort Williams Park, money that helps pay for park improvements. The army of race volunteers also erases virtually every trace of the event within hours as part of the organizers’ commitment to residents. But perhaps the biggest factor is that so many Cape residents participate. The race even lets town residents sign up early in a limited registration. Police Chief Neil Williams has never run the race because “I’ve had to work it every year,” he said. Last year, with help from surrounding departments, officers put in about 85 hours of overtime controlling traffic and providing security for the race and two registration days leading up to it. Although the town gets reimbursed for the officers’ time, it still takes a toll on the department, Williams said. That will be especially true this year, with the tall ships festival, a Portland Symphony Orchestra performance and the Tri for a Cure fundraiser all demanding police services in the weeks leading up to the race. “By the time the Beach to Beacon is over, we’re ready not to see more events come through,” he said. Still, Williams said, he couldn’t ask anything more of the race organizers. Aside from public safety services, McGovern said the race doesn’t ask for much from the town. The fact that Old Ocean House Road was repaved just before the race this year was a coincidence. It hasn’t been done since 1997, McGovern said. “I don’t see anything from the race come up on the town ledgers, which is good,” he said. And the town still gets plenty out of it.